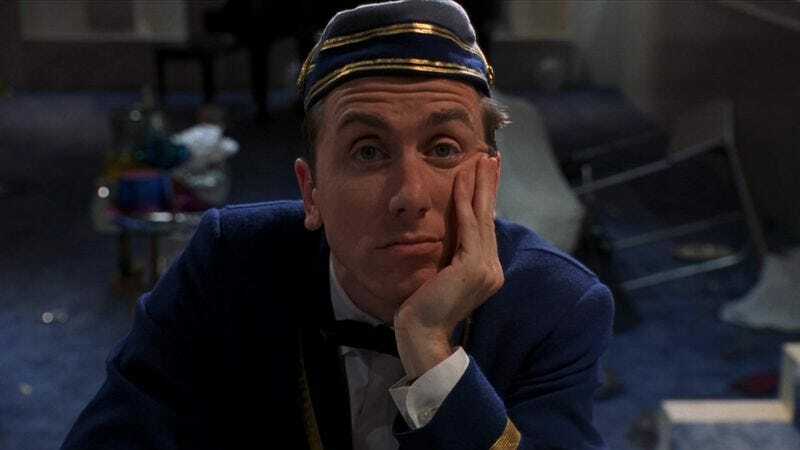 At one point in the hotel-set anthology comedy Four Rooms, there’s a cut to an exterior shot of the movie’s hotel that doesn’t match the cramped, run-down interiors where the action takes place. In 1995, this was an apt metaphor for the film: Upon release, Four Rooms made a swift transition from much-ballyhooed Miramax indie-talent yearbook to much-derided Miramax boondoggle. It didn’t help that the film capped Quentin Tarantino’s post-Pulp Fiction victory lap of acting, guest-starring, talk-show storytelling—basically any activity but writing and directing feature films. When he returned to movie screens with his byline on one-quarter of a comedy about a fumbling bellhop, it seemed to some proof that he was blowing his creative capital as quickly and inexplicably as possible. Of course, Four Rooms isn’t just Tarantino’s project; Allison Anders, Alexandre Rockwell, and Robert Rodriguez each wrote and directed segments, too. But because of Tarantino’s success, because of the movie’s central use of Tarantino favorite Tim Roth, and because much of Four Rooms has the archness of late-’90s Tarantino knockoffs, it feels intrinsically linked to him, fairly or not. Almost two decades later, with QT’s filmmaking career on solid ground, the movie plays as an odd but interesting study of the Miramax scene. The first two segments, granted, aren’t strong. “The Missing Ingredient,” Anders’ bit about a low-rent witch coven, choppily edits together cuteness and cutesiness without much payoff. Rockwell’s “The Wrong Man” has a payoff in mind, but it’s a weak and muddled one that requires an awful lot of wacky vamping to get there; Roth’s hand-waving and face-twitching—throughout, he seems to be crossing Jerry Lewis with Mr. Bean, while hinting at a bizarre childhood—forms its only real pleasures. The reward of slogging through “The Wrong Man,” though, is the movie’s oddball treat of a second half. Rodriguez’s “The Misbehavers,” with a cartoonishly debonair Antonio Banderas and a pair of mischievous, bickering siblings, feels like the darker inspiration for his Spy Kids series. Then, in Tarantino’s “The Man From Hollywood,” the celebrated filmmaker—coming off a year of overexposure—casts himself as a famous movie star drunkenly riffing on an old Alfred Hitchcock Presents episode. Tarantino must have been drunk on self-awareness or a total lack of it; either way, the segment makes for a fascinating Pulp postscript. Tarantino uses long, continuous takes that look like POV shots but don’t correspond to an actual on-screen character—which is to say, he puts the audience right there in the bleary, debauched hotel suite. Four Rooms is more curiosity than necessity, but its built-in unevenness mimics the structural quirks of a past-its-prime hotspot where famous people used to hang out. Availability: Four Rooms is available on DVD, to rent or purchase from the major digital services, and to stream on Netflix.